Between doorways, stairwells, and the unique design of your vending area, measuring for a vending machine cannot be overlooked. While the difference in specifications between the various machines is sometimes less than an inch, the smallest amount can be the deciding factor whether the equipment will fit or not. Use this vending machine size guide to help determine if your location has enough room for a vending machine. There are three variations of vending machines: a stack vendor, glassfront, and combo machines. Each serves a different purpose, but stack vendors are typically the most common. Glass front machines hold a lot more products and are used for higher volume locations. Combo machines, however, are used for smaller locations with lower sales and space constraints. The average number of product selections for Stack Vendors is 8-10, and it's about 40-60 for Glassfront Vendors. Despite vending machines having Coca-Cola, Pepsi, or some other name brand on them doesn't mean that's who built them. 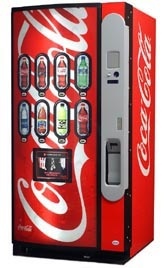 In fact, those big beverage brands get the machines from one of three main companies that manufacture vending machine equipment: Dixie Narco, Royal Vendors, and Vendo. 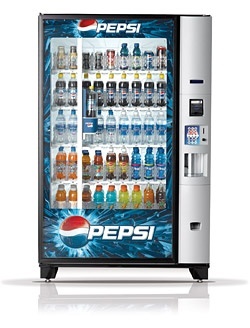 Each company manufactures a variety of vending machines that come in different sizes. If spacing is your highest concern and you're not quite sure if a vending machine will fit in your location, below is a more detailed look at the various sizes of vending machines to help with your search for vending services. 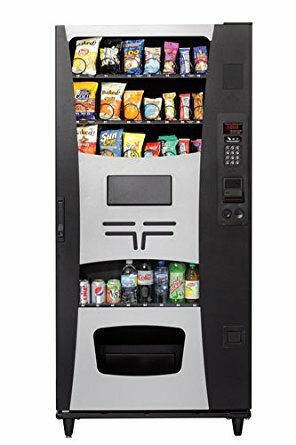 Vending Group provides free vending services for hotels, apartment communities, retail, and other businesses across the United States. Fill out the form below to request a vending machine for your location.